Rudolph Ackermann was born on 20 April 1764 at Stollberg, near Leipzig, in Saxony. When he was fifteen, Ackermann was apprenticed to his elder brother Friedrich, a saddler. During his apprenticeship, he also learned to draw and engrave. In 1782 started training as a carriage designer, first in Dresden and then at Hueningen, in Switzerland. In 1784 he was employed for six months by Antoine Carassi in Paris. He worked for the carriage maker Simons in Brussels in 1785–6. He moved to England in 1787, where his model of a state coach for the carriage maker Goodall led to his first important commission in 1790, to design a state coach for the lord lieutenant of Ireland. 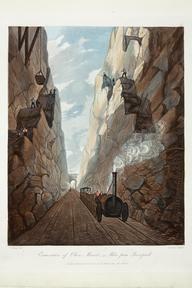 Between 1791 and 1820 he published thirteen books of designs for carriages. Ackermann formed close connections with other émigrés from Saxony, most significantly with the Facius brothers and with J. C. Stadler, who worked as engravers for the leading print publisher John Boydell. From 1795-1805, he ran a drawing school in Strand, and in 1796 he published the first of many drawing books. In 1797, he began publishing decorative hand-coloured prints. During the first decade of the 19th century, Ackermann continued to design state and other carriages. He became a United Kingdom citizen on 24 March 1809. In 1808 and 1809, Ackermann issued two publications which secured his reputation as a publisher of the finest colour plate books: The Microcosm of London, and the monthly magazine Repository of Arts. Ackermann employed the architectural draughtsman Augustus Pugin, and the figure drawer Thomas Rowlandson to provide illustrations and architectural drawings for his engravings. Ackermann formally handed over his business, Ackermann & Co, to his younger sons in October 1832. He suffered a stroke in November 1833 and died on 30 March 1834 at his home at Cold Harbour, Finchley.